The province and town of Phetchabun lie in a remote, relatively difficult to access long valley (Pasak Valley) in the Phetchabun Mountain Range. It's counted to the lower north of Thailand, but in fact it's a geographic junction between central Thailand, Isan and the north. 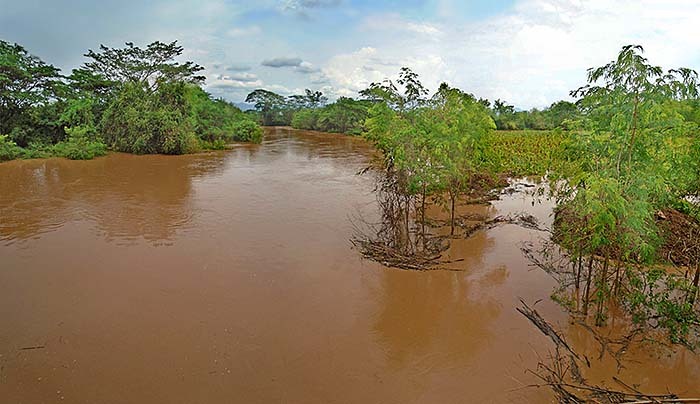 Embedded in plains through which Nam Pasak, a smaller river, curves it's way, the horizons to the east and west are paralleled by the two ranges of the Phetchabun Mountains. Access to the valley was traditionally only through it's natural openings in the south and north. Nowadays, following excessive logging, two major roads cross the mountains and link the valley, which is Phetchabun Province, additionally with the outside world, namely Phitsanulok and Chum Phae (Khon Kaen Province). 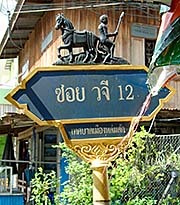 The main road through Pasak Valley is Thai Highway 21 (Khotchaseni Road). It links the town with Saraburi and Lopburi in the south and ends in Lom Sak north of Phetchabun town from where Highway 203 continues to Loei. 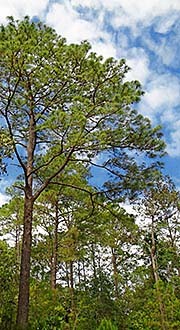 The climate is subtropical and therefore hot and often humid. Monsoon rains appear mostly in the months from May to September, while September is the most rainy month. March and April are the hottest. The time from November to February is rather dry and relatively cool. 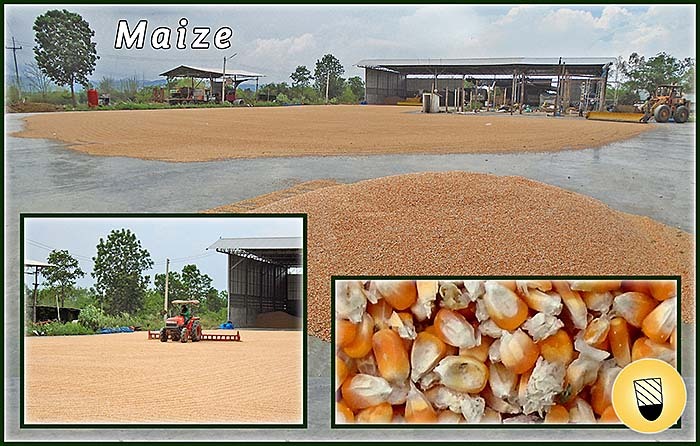 The economy is widely coined by agriculture, that is rice cultivation in the fertile plains, together with tamarind, fruits, maize, tobacco, cotton, oranges and livestock. Cabbage and a number of other vegetables can be added. 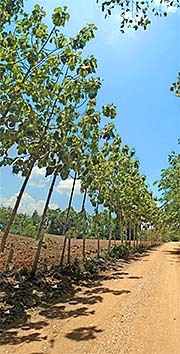 Teak plantations appear at the foot of the eastern mountain range. Also rubber trees grow here. Fishing in Nam Pasak and many lakes and ponds provides a share of the diet. Part of the economy is trade, represented by the usual retailers in town. In the last years the unavoidable big chains like Tesco Lotus, Big C, Macro, Home Pro and others placed huge branches at the town's periphery and are fighting the local retailers down with dumping prices until they rule the market. There is no tourism at all in town, and, apart from Si Thep Historical Park 130km south of town, no tourist potential at all. The only occasional Westerners one get's to see here are the expats who settled down here with their Thai wifes. Alltogether Phetchabun is, compared to other parts of Thailand, underdeveloped and has no producing industries. In the countryside it looks rather poor. Due to the area's remoteness, it's laid-back and life goes slowly. The people are following widely their traditional way of life, based on fatalism, stereotypy and superstition, however meanwhile enriched with the high-tech and the false promises of the digitalized world. 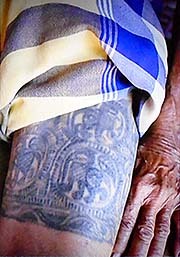 Supposedly the rural population consists by a great deal of the descendants of Khmer who were brought from Cambodia in the decades around 1800 CE as a slave population and forced to settle down in the region, probably together with Laotions who before lived on the eastern banks of the Mekong River and shared the same fate (a pattern widely used by the Siamese conquerers in the early 19th century, particularly after the Laotion uprise in 1826). In Phetchabun town live a number of wealthy Thai and Thai/Chinese who are in the economic and administrative key positions. The mentality here is clearly different from that in other parts of Thailand. A certain xenophobia lies in the air behind the surface, what is not untypical for regions in which few foreigners live. The term 'farang' is often to hear when being around. Still, many people are friendly and helpful, while others are curious about foreigners and are glad to have what to talk about. The educational level is low. Very, very low. In 2015 I met a connoisseur of Thailand who claimed that the Thai youngsters in the age of fifteen years old now loose one IQ point per year. As experts often point out, the educational level of a people correlates with the degree of social (in)equality of the society they live in. In such a rural place like Phetchabun it's not surprising that the level is rather below that in the developed parts of the country. Also remarkable is the fact that a significant part of the population is nowadays heavily overweight, often already from childhood on. Low education and unhealthy lifestyle come together. Alcoholism seems to be a widespread appearance, as it is in many populations. Following official statistics, Phetchabun town has below 25,000 inhabitants while the whole province has a population of almost a million. That seems disproportional and since the town is not that small, I would suppose the urban population as much bigger than the given figure above. 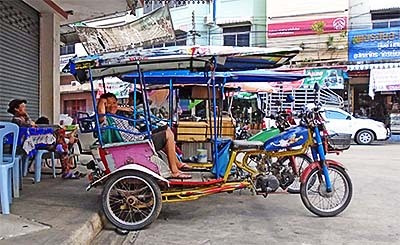 The number of vehicles is, as everywhere in nowadays Southeast Asia, booming. The streets get filled with cars, trucks and, above all, motorbikes. New roads are continuously built and others widened to provide capacity for the swelling traffic disaster. Remarkable are the many redlights in town, of who are most not only of no need but clearly blocking the traffic. The best and easiest way to organize traffic at crossroads is a roundabout. Once built, it requires practically no maintainance and does not cause additional costs. Roundabouts keep the traffic in flow and avoid unneccessary waiting times. 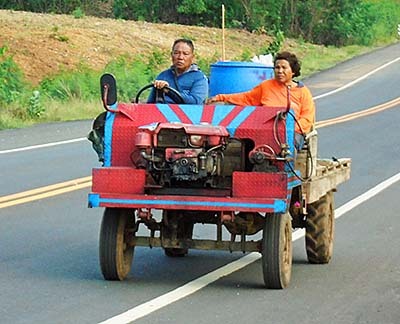 Redlights therefore are expensive and their maintainance costs the community permanently money. 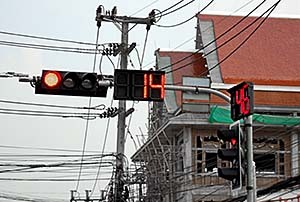 In Phetchabun (I observed the same thing in Saraburi), the redlights are switched clockwise, so that three parties have to wait while one party is free to drive for a few seconds. Verymost of the time the redlights are, as their name indicates, red. Since this repeats from crossroad to crossroad, unnessecary waiting times add up. Often traffic is blocked for long, while no one is benefiting from the green at another side. Why the decision has been made in such an unfavourable way remains a subject for speculation. Generally, not only in Thailand, the principle 'profit over people' leads to such lucrative business deals between communities and corporations (like electronics producers). Another method to boost automobilism is to destruct public transport. There is practically no public transport inside town. Those, who don't drive an own vehicle have to pay for one of the few samlots (motorbike rikshaws), who are concentrated mostly around the bus station at highway 21. Elsewhere, one usually never sees one around. For trips around town are the first choice for short-distance trips, that is within a radius of 30km, 40km, the songtheaws. That's kind of a pickup which truck bed has been altered and equipped with two long benches for passengers. For intercity trips are two [!] bus stations in town. One is at highway 21, where buses from Bangkok, Lopburi and Saraburi go and arrive. Another bus station is about two kilometers east of it, in a new part of town. Disastrous is the huge number of overrun animals on the province's roads. Thailand is known for it's terrific accident rate in which annually around 20,000 people die (not to mention those injured and all the other trouble coming with an accident). Moreover one sees every few hundred meters on the country roads killed animals of different kinds, dogs and cats anyway, birds like the greater coucal, a variety of snakes, I saw a turtle dead with a cracked shell and so on. Sometimes, the animals are torn into pieces, sometimes they are still alive and die a slow, cruel death. All that is part of the silent suffering inflicted by the traffic disaster. See also: 'Traffic in Thailand'. The province of Phetchabun consists of the Pasak Valley and the greatest parts of the Phetchabun Mountains. In the south it's running out into the central plains of Thailand at Si Thep district. 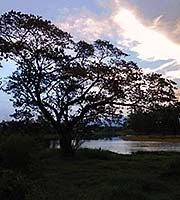 In the mountains, who are covered widely with decidurous monsoon forests, are several larger areas declared as national parks. 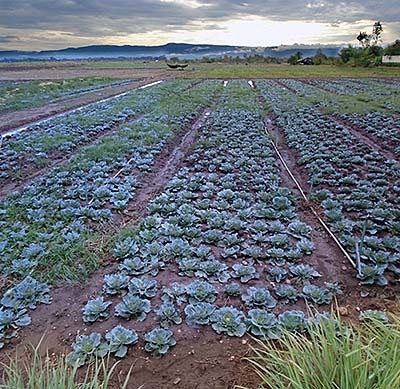 The valley itself is a large, flat plain between the two mountain ranges of the Phetchabun Range and, so far I saw, completely occupied with agriculture and smaller places like villages and towns. 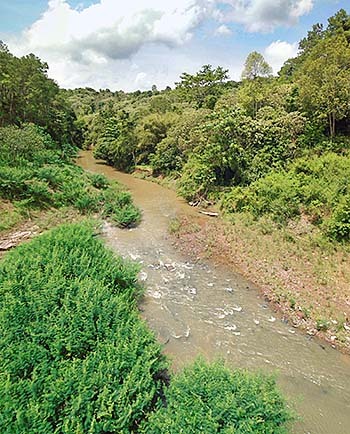 The large valley between the two Phetchabun Mountain Ranges embeds a number of creeks who feed a central stream. Pasak River (Nam Pasak) origins at Dan Sai in Loei Province. It later joins Lopburi River and more downstream becomes a tributary of the Chao Phraya at Ayutthaya (near Phom Phet Fortress, southeast of the old city). Pasak is altogether 513km long and drains a watershed of roughly 16,000km2 to 18,000km2. The annual discharge is given as large as 2,4km3. Since the water level varies seasonably considerable over the year, for flood and irrigation purposes, in 1994 the Pasak Cholasid Dam has been built in Lopburi Province. The dam provides a modest 6.7 megawatt hydropower. The Phetchabun Mountains are a double mountain range which runs in north-south direction, as most mountain ranges in Southeast Asia do. The western chain is called Khao-Lang-Non-Son and the eastern one bears the name Dong-Paya-Yen. The highest peak lies in Phu Hin Rong Kla National Park in the western range. It's 1,794m high. 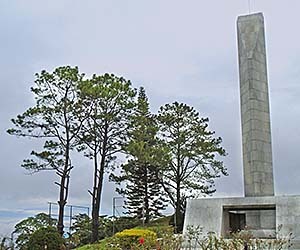 Another high peak is Khao Kho (1,143m), roughly some 50km northwest of Phetchabun town. 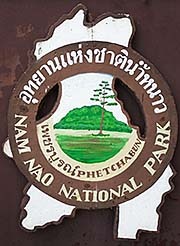 Two more national parks are Namtok Chat Trakan and Thung Salaeng Luan in the north. 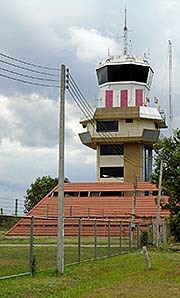 Between the two ranges stretches the long valley in which Phetchabun town is located. More towns in the valley are Lom Sak, Nong Phai and Wichian Buri. 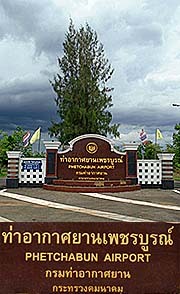 Alltogether, the geographic ensemble is Phetchabun Province. The mountains are named after the city. The Phetchabun Mountains are a natural barrier between central Thailand and the northeastern Khorat Plateau (Isan). The eastern range is prolonged by the Dong Paya Yen Mountains who blend into the Sankamphaeng Mountains and, to the east, into the Dangrek Mountain Range. It was always an obstacle for travellers, trade caravans as well as armies to cross the mountains between Siam (central Thailand) and the eastern territories of the Khorat Plateau, Cambodia and Laos. However, the favourable way was always that from Ayutthaya or Bangkok to Khorat as a first base in the east. 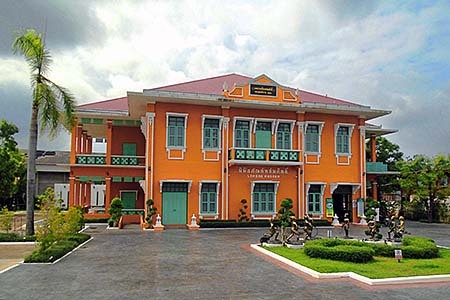 Only in the late 19th century, with the construction of the Khorat Railway, the connection was established with the means of the industrial age. 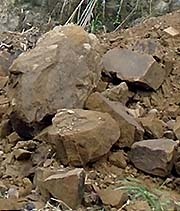 The Phetchabun Mountains consist of limestone, together with sandstone and slate. Additionally there are portions of granite, basalt and porphyran. Widely overgrown by dense vegetation, at some, few points one get's to see the stony backbone of the mountains. That is mostly where the roadbuilders dug aisles into the mountains. 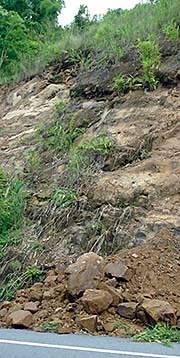 At other spots landslides appear, particularly in rainy season, revealing the naked ground. Urbanization and agriculture has already occupied any square centimeter in Pasak Valley und is creeping now from all sides slowly into the mountains. More and more the foothills are getting eaten up, humans encroach into the side valleys and sometimes also deforest the steeper slopes for planting vegetables. The worst example of human encroaching are the rolling hills around Khao Kho in the western range. The whole, large area has become a popular tourist destination with plenty of resorts, restaurants, shops, dwellings of different kinds, petrol stations, ATM's and a wide road net with plenty of traffic. Agriculture is also here in abundance. At one point a field of wind turbines is planted to produce at least part of the electricity of the tourist colony. The town of Lom Sak lies roughly some 40km north of Phetchabun town at the banks of Pasak River. It's as modernist as almost anywhere and has no charme. The only remarkable thing I saw was nicely Lom Sak Museum, which gives some insight in the local history and the particularities of the local people, who are different from those in Phetchabun. Interesting is a movie they show in the musuem in which the spirit of the old times get's remembered. 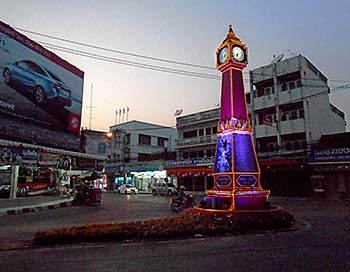 The clocktower was in the center of town and there was the slow, laid-back life centered around it with the bicycle rikhsaw drivers and no cars and motorbikes around. There was a famous barber shop and two opium houses. The old wooden clock tower fell later victim to the new one we see today. It seems that Lom Sak is older than Phetchabun and that it's history dates back to the Sukhothai era. It may have played a role in the wars between Sukhothai and Angkor. 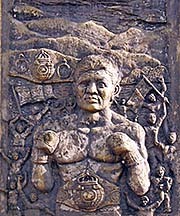 Lom Sak appears in the inscriptions no. 1, 2 and more as being part of the empire; however, the inscriptions are no reliable historical source. In the reign of king Taksin (1767 - 1782), general Phraya Chakri (later king Yodfa, Rama I) had a campsite here with his army when coming back from a campaign in Laos. He brought prisoners of war from the easter side of the Mekong River and settled them down in the region. Still today the locals are referring to their Laotian ancestry as being Lao Lom People and speaking Lao Harm language. However, the place was maybe at the beginning at a nearby location and moved to it's nowadays location in the reign of king Phra Nang Klao (Rama III, 1824 - 1851). There were Japanese troops in town during the Second World War, about who one of the actors of a small story tells about in the museum's movie. Lom Sak has been bombed by American airforce in that time, probably targeting the Japanese camps. In the 1960s and 1970s Thai Communists were in wide control over the forested, mountainous surroundings and fought successful against the Thai Army. They got enforcement from many dissapointed and angry students after the Thammasat Massacre in 1976. It's very difficult to get information on Phetchabun's history. Because of the geographical remoteness it has been bypassed by most of Indochina's history. In the history books on Thailand, it's, so far I see, never mentioned. History happened around, but not here. Probably it shared a similar fate like the nearby Khorat Plateau, which was sparsely inhabited until the first decades of the 19th century (see: 'History of Isan'). Nevertheless, there are some few leftovers in the Pasak Valley. 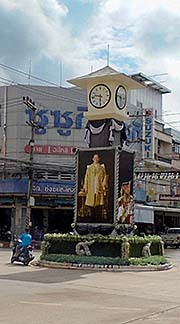 In the very south, Si Thep certainly was a link between central Thailand in the west and Isan and Cambodia in the east. What concerns the province's capital, Wat Mahathat, the main Buddhist temple in the center of town is an ensemble of a couple of new buildings directly close to an excavation site, where an old brick construction, the chedi of a former sanctuary, is getting restored. 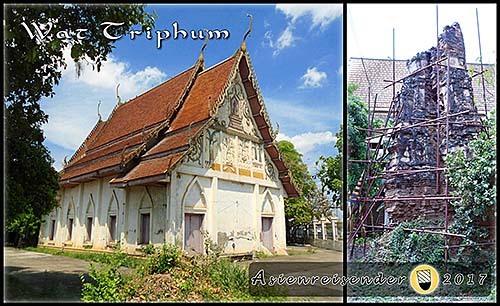 Another old temple site in Phetchabun town is Wat Triphum. Beside the viharn is an information sign placed which is barely readable anymore. It tells a mystified story about a dhammaraja Buddha statue, which has been found in Pasak River and around which some (alleged) miracles happened. The rest of town looks to me as faceless as a place could look, with practically no remains of any history. Not even some of the old, wooden shophouses are left who coined Indochina's towns a hundred years ago so much. 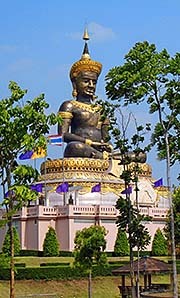 About 130km south of Phetchabun town lies the historical area of Si Thep (also: Sri Thep, Sri Deva; nowadays Si Thep is also the southernmost district in Phetchabun Province). 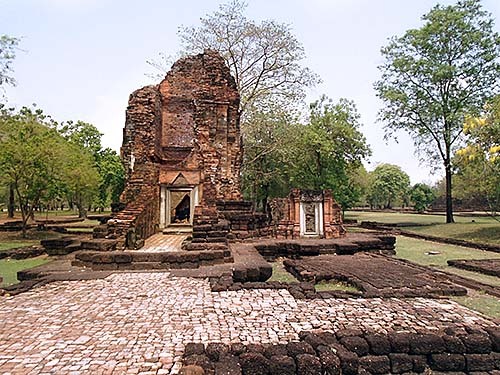 Si Thep Historical Park is a large ancient city surrounded by a wide moat and the remains of a city wall. A number of gates existed in the old times, of who now merely breakthroughs are left. 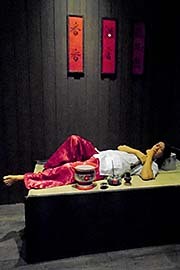 The place's history dates back to pre-historical times. Later, a city-state was established here supposedly in the 5th century CE. A variety of cultural influences who are traced here don't yet allow a clear classification. It may have been a foundation of the empire of Funan, which was later continued by it's successor, Chenla. Clearly, elements of the Dvaravati Culture are represented in Si Thep, which came under Khmer rule after the Angkorean conquests of central Thailand in the early 11th century. The Khmer gave the city it's last coinage, until it fell victim to the century-long wars between the uprising early Thai kingdoms of Sukhothai and Ayutthaya on one side and Angkor on the other from the 13th century on. Probably the city has been razed at least once by an enemy's army. The here settling people were certainly of the Khmer/Mon group. Early immigrants and founders came maybe directly from India, either via Burma or from the coast of the Gulf of Thailand. Old sculptures who were found here show a style very close to Indian models. Both religions, Hinduism and Buddhism vere vibrant in Si Thep. Khao Klang Nai is a leftover of the Dvaravati Culture. 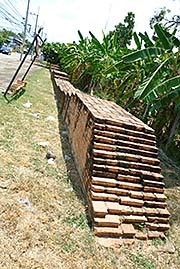 In the past it was completely covered with mortar and depicted with a number of stucco motives (of who gives the middle bar three examples) who show similarities to other Dvaravati artefacts in central Thailand, namely those found at Wat Nakhon Kosa in Lopburi, in the ancient town of Nakhon Pathom and at Khu Bua in Ratchaburi. There are suggestions that Khao Klang Nai once bear a structure on top of it, which has been crumbled away over the centuries. 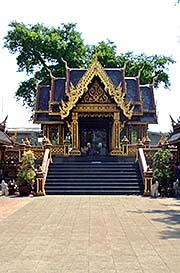 The historical place has been discovered by Siamese prince Damrong Rajanubhab in 1905. Archaeological research and excavations have been made by the Briton H.G. Quaritch Wales in 1935. Wales reconstructed the oval shape of the old city and explored the exact course of the old walls and the moat. A number of sculptures from the Dvaravati Culture and some of Hindu gods have been found; most of them are now in the National Museum of Bangkok. Of the more than hundred sites within the twin-city, only few have survived the test of time. Within the city walls were also dozens of ponds, of who most are spilt. This article is based on decades of practical experiences and observations. Moreover it's based on a number of publications. You find a list of them on the Literature page. However, it's not at all exhausting; it comes together with uncounted articles from newspapers, magazines, (qualified) websites and movies, both fiction and documentary. 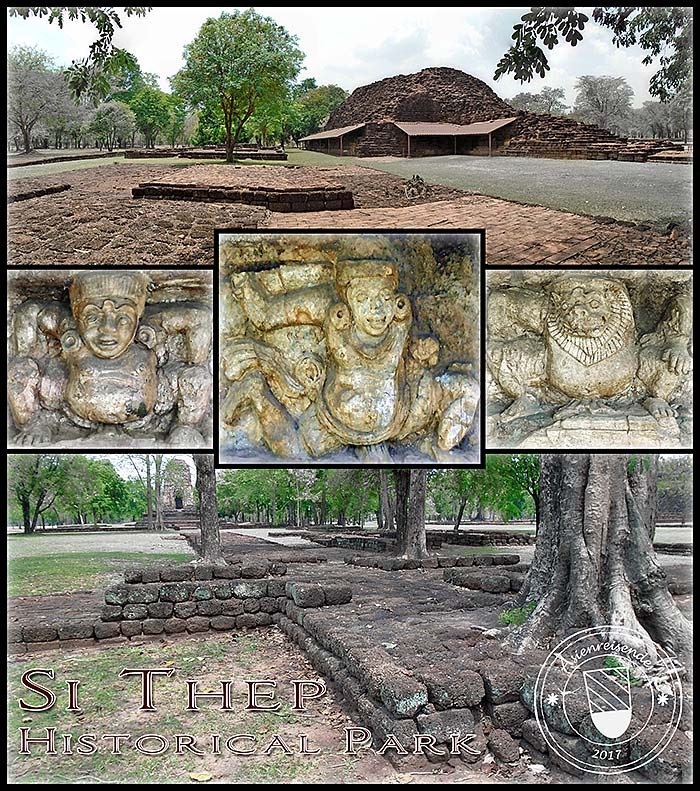 The Tourist Information Center of Si Thep Historical Park gives the visitors a small information brochure of the park with valuable information, made by the Fine Arts Department of Thailand. Sometimes, a good talk with a connoisseur of a certain topic provides me with facts, ideas, inspirations and innovations and/or reveals a mistake.